Who knew being so personal could make us go national? SPEAR Physical Therapy focuses solely on its patient successes. Which makes national reward recognition that much more humbling. Our two-dozen impassioned physical therapists never saw this coming. They spend each working hour in having personal conversations with NYC patients, helping them overcome physical challenges like simply rotating their shoulders, walking up stairs, and preparing for surgeries. So when Chase contacted SPEAR Physical Therapy last month requesting that the team be included in Chase Bank’s Mission Main Street advertising campaign, our therapists were amazed. We all knew that our patients and referring physicians have faith in us, but who knew that even Chase Bank considered us as one of the greatest small businesses in the country. 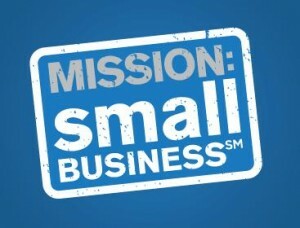 Of the 4 million small businesses serviced by Chase, just seven were chosen to appear in this campaign. Of the seven businesses, SPEAR was the only healthcare company. In the healthcare industry, which is not heavily marketed, it is profoundly rare for medical practices to be featured in any corporate campaign–let alone in a campaign featuring small, boutique, customer service focused businesses thriving in the face of economic turmoil. SPEAR Physical Therapy is on a list that includes the likes of a toy maker, creative contractor, demolition expert, airboat manufacturer, and an art and advertising fabricator, all of whom are receiving recognition for passionately doing what they love: helping to grow the local economy and serving the community in the process. By treating each patient as a personal friend, SPEAR’s physical therapists have helped expanded its physical therapy service into five neighborhoods throughout New York City. SPEAR Physical Therapy’s personal relationships with its customers is the #1 reason they are being featured in Chase’s Mission Main Street campaign. Recognizing our customers has the entire country recognizing us! Inc. Magazine also recognized SPEAR Physical Therapy’s dedication to it’s customers. 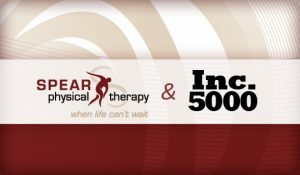 This summer became the second time that SPEAR was named one of Inc. 5000’s fastest growing private businesses. SPEAR Physical Therapy is the only physical therapy practice in NYC and even New York State to receive the coveted distinction. For Dan, Dave, and Ryan, the recognition is a humbling reminder of how far the team has come. Being able to share the home we’ve built over a 15-year period treating over 100,000 patients with our team members, families, friends, physicians and patients has been a joy, and we can’t thank you enough for coming on this journey with us! We look forward to serving our patients and the community, continuing in our tradition of compassionate care for the New York City area! Read more about SPEAR and the Inc. 5,000 list here. 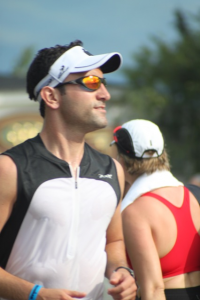 After giving him a few weeks to recover, we recently sat down with 44th Street Clinical Director and therapist Ryan Kitzen to talk to him about completing this year’s Ironman Lake Placid. Not surprisingly he had an inspiring story to tell, giving us a first-hand look at what it’s like to prepare for and complete one of the most grueling triathlons in the country. How did this all begin for you? I couldn’t even swim at the time and I just thought it was unbelievable that these people actually put their bodies through something so grueling. It looked like such like a test of mind and body. The special also had these stories of people that do the Ironman races after overcoming physical challenges, like people wearing prosthetics, or being legally blind. They were all so inspiring and at the time a small, small part of me was like, “Wow. 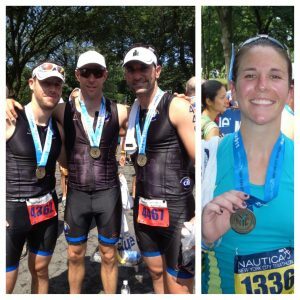 If these people can do it, I should at least try to do a sprint triathlon.” So that’s what kind of got me into triathlons about four years ago; never with the intention of doing the Ironman, though. THAT I thought was absolutely impossible. Today marks Day 7 of what so far has been a very interesting 2012 Olympic games (badminton players we’re talking to YOU)! 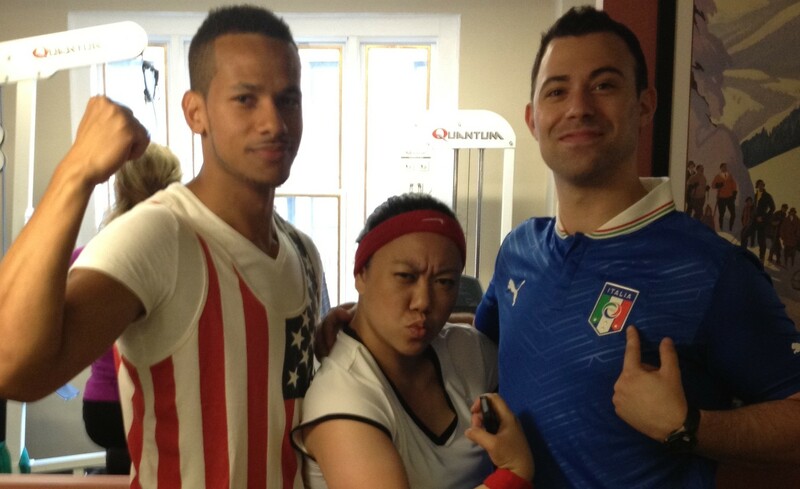 SPEAR’s 56th street location celebrated the start of the games last Friday by sporting their favorite country’s colors (or in some cases showing up in their gym clothes). Italy, Germany, Spain, Canada, and of course the US were represented by members of our clinical and clerical delegations. Today we asked a few SPEAR team members which Olympic sports they would compete in and why. We received some surprising answers, including a few sports from the winter games! On July 8, 2012 four of our therapists competed in the NYC Triathalon. Dave Endres, Ryan Kitzen, Jared Lando, and Kelly Althaus completed a 1500 meter swim followed by a 40 kilometer bike ride and a 10 kilometer run. This week we’re posting their thoughts about the race. 12:15am: Massive thunderstorm hits UWS and wakes me up. 12:25am: 3 yr old son wakes up yelling, “Daddy, I’m scared!” Rub his back for 20 mins, back to sleep by 1am. 4:00am: Sleep through my 4am wake up alarm! Earlier today we hit “submit” on our entry into Chase’s Small Business Grant Competition. Chase is awarding $250,000 to select small businesses that can demonstrate that they will use the grant in a way that will benefit the community. To enter, each business was asked to answer a series of questions that run the gamut between “tell us how great you are” to “what kind of challenges do you face?” We essentially had to tell SPEAR’s life story, mining our past and our present for nuggets we wanted to share with Chase. When our team got together to think about the answers to these questions, we got an unexpected reward. For the first time in a long time we paused to think about how far we’ve come and how much we’ve gained in the past 14 years. We began discussing all that we’ve learned about our craft, the joy of helping patients, of bringing them back to their expected level of life activity, the pleasure we’ve experienced working together and getting to know each other and developing our team. As the memories mounted, it all became overwhelming. In one afternoon, we revisited 14 years of growth and turned them into 2000 words.